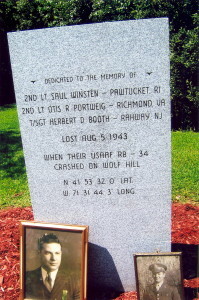 The Wolf Hill Plane Crash – Georgiaville, R.I.
A U.S. Army RB-34 like the one that crashed on Wolf Hill in the Georgiaville section of Smithfield, R.I. – August 5, 1943. 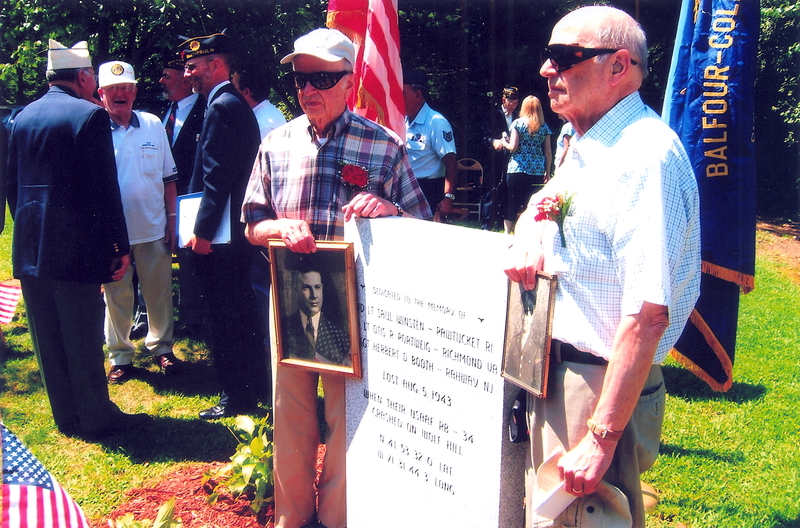 On August 5, 1943, a U.S. Army Air Corps, twin-engine aircraft, crashed on the Georgiaville side of Wolf Hill and three servicemen lost their lives. As with many events, details get forgotten over time. 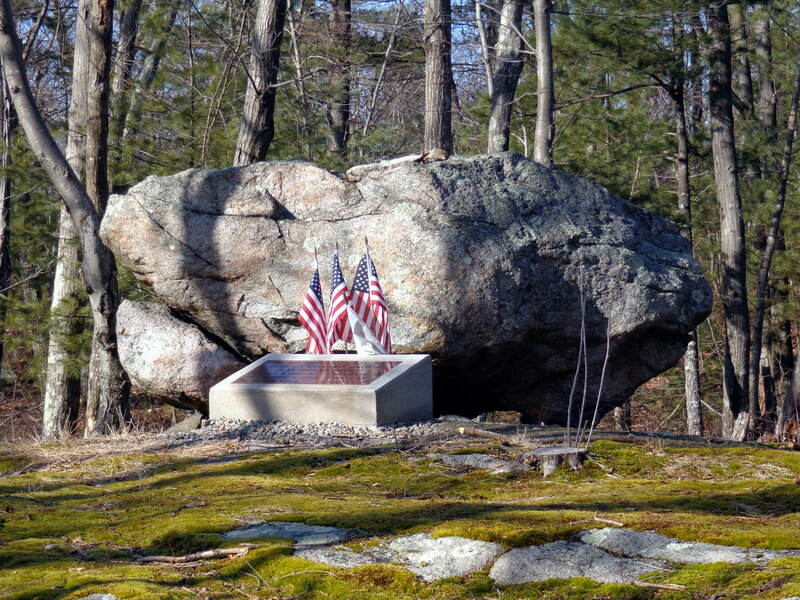 The story is worth re-telling both as an historical event, and as a way to remember the three men who died in the service of this country within the Town of Smithfield. The plane was a Lockheed, RB-34. To be more precise, it was an RB-34A-4, Target Tug, one of only 16 produced for this purpose. Its military serial number was 41-38116. The B-34 was initially designed as a light coastal patrol bomber to be used in anti-submarine warfare by the British military before the United States had entered World War II. It had its origins in the Lockheed, Model 18, Lodestar, a civil aircraft, which was re-designed and given the military designation of the Hudson MK I. In 1940, the British Government ordered 375 Hudsons. Subsequent orders were placed with technical improvements and modifications to armament, thus giving the planes designations of MK II, MK IIA, and GR.MK V.
When the United States entered the war in December of 1941, 200 Hudsons destined for England were diverted off the production line for use by the U.S. Army Air Corps and given the new military designation of B-34. 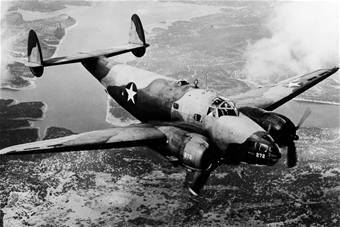 The “B” designated it as a bomber aircraft. Most of the B-34s were later converted for use as training aircraft. Of these 200 aircraft, 57 were used as bomber trainers, 28 were used as gunnery trainers, 16 as target tugs, and 13 as navigational trainers. The remaining 86 planes were passed over to the U.S. Navy when it was decided that coastal protection should fall under the Navy’s jurisdiction. The Navy re-designated the planes as PV-1 Ventura’s and from 1942 onwards, all future orders went to the Navy. The Ventura’s were used by both the United States and Britain throughout the war. In October of 1942, the planes that remained with the Army were re-designated RB-34’s to indicate their changed operational status as training aircraft, followed by a letter and number designation to indicate its training role. For example, bomber trainers were designated RB-34A-2, gunnery trainers as RB-34A-3, target tugs as RB-34A-4, and navigational trainers as RB-34B. The plane that crashed on Wolf Hill was a target tug. Its function was to tow canvas gunnery targets a safe distance behind it, usually over open water, where fighter pilots would take turns making “runs” at it with their aircraft. The fighter pilots would shoot paint-coated ammunition, with each pilot given a different color, so that afterwards, when the target was evaluated, one could see which pilots had done well and which hadn’t. According to the now de-classified official Army Air Corps accident investigation report obtained from the government, on the date of the accident, the plane was being ferried from Westover Field in Massachusetts to Otis Air Base in Falmouth, Massachusetts. The flight plan filed by the pilot, 2ed Lieutenant Otis R. Portewig, stated that take-off time would be 16:00 hours, (4 p.m.), and the flight would take 45 minutes passing over Rhode Island en-route. Flying conditions for that day were good. There was a 3000 foot ceiling of broken clouds, with scattered clouds at 1600 feet. Visibility was unrestricted, and winds were out of the north-north-west at 8 to 12 miles per hour. The plane was given enough fuel for four hours of flight time. While passing over Scituate, Rhode Island a mechanical problem developed with the right engine. Several witnesses gave statements to Army investigators charged with determining the cause of the accident. The following quotes are taken from the official U.S. Army crash investigation report. Daniel arrived home at about 5:30 p.m. and told his father what he had seen. His father directed him to write it all down right away and later forwarded the report to the Army. From his home on Coolridge Avenue in Greenville, Francis Kane also saw the plane pass overhead. He reported, “The plane seemed to be gliding, because the left engine was not running, and the right engine was just sputtering. When I first saw the plane it had an approximate altitude of 500 ft. and was loosing altitude all the time.” Mr. Kane was also a volunteer fireman from Greenville and a few minutes later he responded to the crash site. The crash site, according to the Providence Journal, reportedly occurred on a rocky ledge on Wolf Hill, about a mile west of Farnum Pike, and about a mile and a half south from the old Smithfield Airport, which was then located where Bryant University is today. The debris field was supposedly spread over an area 50 yards long and 20 yards wide, “with the body of the plane having come to rest on a huge rock”. 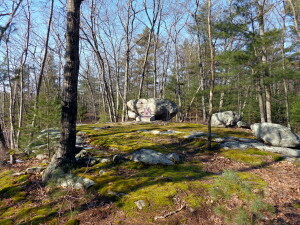 Site of the Wolf Hill military plane crash, August 5, 1943, Smithfield, R.I. The explosions and column of black smoke from the fire attracted curious spectators from the surrounding area. A call was placed to the volunteer fire department and crews from Georgiaville and Greenville responded. Once they arrived, they found they couldn’t get near the scene with their engines, so they had to walk in with portable pump cans and shovels to attack the fire. Officers of the Smithfield Police, led by Chief Albert N. Lacroix rushed to the scene with first aid equipment. State Troopers from Chepachet and Lincoln also arrived, as well as members of the state forest fire patrol. When word reached St. Michaels Church in Georgiaville, Reverend James H. Beattie went to the scene to administer last rites to the deceased. Teresa (Beausejour) Beaudoin, who was 14 at the time of the crash, recalled a similar expierence in September, 2005. “One day during that summer when I should have been cleaning my room, I took time out to look out the window. Suddenly, I heard the high pitched screaming sound of a plane, nose diving toward the earth. Then a crashing sound. Curiously, I ran toward the area of the crash, which seemed to be close by. I arrived at the same time as the Georgiaville Fire Department, so I followed the fire fighters carrying water tanks on their backs, into the wooded area behind Fred Andrew’s house, also on Farnum Pike. At the site, I observed, a soup bowl shaped area, about thirty or forty feet in diameter and about six feet deep (in a child’s eye). Halfway up the incline, was the motionless figure of a person attempting to crawl out of the hole. He was about halfway up, on his knees, with one hand on the ground reaching and grasping for something to help him out. Other’s who were at the scene that day, have also described how two of the bodies were found in “a crawling position” outside the wreckage. Based on this information, it’s possible that two of the men aboard survived the initial crash and were killed by the subsequent explosions that followed. Blocking off the crash scene was, and still is, common practice for a number of reasons. Afterwards, very little information about the crash was released by the Army, and with the war in full swing, it quickly became old news as far as the press was concerned as there were no follow-up articles about the incident in any of the newspapers. This later led to speculation and rumors by townspeople that there was more to the story. Some claimed the plane was overloaded with bombs and that was the reason for the crash. Others said it was on a secret mission and that was the true reason everyone was kept away. One rumor went that the plane was testing secret experimental radar jamming equipment. All of these rumors were false, but they persisted for many years. Army officials probed the crash site for clues to the disaster. Captains Joseph T. Klemovich and Howard A. Tuman, along with First Lieutenant Charles B. Gracey Jr., are listed in the accident investigation report as the three men assigned to investigate the crash. They were pilots assigned to the 58th Fighter Group of the Fifth Air Force, then training at Green Field to go overseas. (Green Field is known today as T.F. Green Airport in Warwick.) The fighter group was transferred overseas shortly afterward. Lieutenant Gracey was killed a few months later on a mission in New Guniea. Captain Klemovich retired a Colonel in the Air Force and passed away in 1984. Captain Tuman also retired a Colonel in command of the 310th Squadron of the 58th Fighter Group. On June 17, 2003, he related from his home in Oregon that he and the other investigators were 21 and 22 years old at the time training to be fighter pilots at Green Field in preparation for overseas duty. He didn’t remember many details about the investigation but related that the transfer of troops and personnel happened fast and was common during the war. He added that stateside military aircraft crashes unfortunately happened all too often. There simply wasn’t the time or the resources to conduct long-term investigations as would happen today. All three men on board the RB-34 died in the crash. There was the pilot, 2ed Lieutenant Otis R. Portewig, age 27, of Richmond, Virginia. A native of Richmond, he graduated from John Marshall High School, and went on to Roanoke College where he specialized in Aviation. He learned to fly at Central Airport and later became an instructor there. On one occasion he won first place in a spot landing contest He was also a flight instructor at Byrd and Hermitage Airports in Richmond, as well as an instructor at the Lynchburg Aviation School, in Lynchburg, Virginia. He enlisted in the Army Air Corps on November 15, 1942, at Indianapolis, Indiana, and was commissioned a second lieutenant due to his seven years of flying experience. While in the Army, he was stationed at Judson Barracks, Missouri, the Bel Val Air Base in Austin, Texas, the Alliance Air Base in Nebraska, and at Langley Field in Virginia. He also served as a flight instructor in the Army. He was attached to the 3rd Air Force, 1st Air Support Command, 66th Troop Carrier Squadron. In June of 1943, he was transferred from the Troop Carrier Squadron to the 1st Towing Squadron out of Otis Air Field in Falmouth, Massachusetts. Lieutenant Portewig was survived by his mother, Maud Portewig, and two brothers, James M., and Edwin, L. Portewig. Then there was 2ed Lieutenant Saul Winsten, age 25, from Pawtucket, Rhode Island. He was assigned to the 901st Quartermasters Company, Aviation Service. He graduated from Pawtucket High School and attended Rhode Island State College before entering Brown University School of Law. He worked his way through college and law school by working at the university and at Saltzman’s in Pawtucket. He graduated law school in June 1941, and shortly thereafter, passed both the Rhode Island and Massachusetts Bar Exams getting high marks on each. 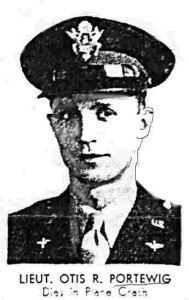 Two months later, he entered the Army on January 17, 1942, and was accepted to Officer’s Candidate School for the Quartermasters Service at Camp Lee, Virginia. He was survived by his mother Leah Winsten, and two brothers who were also serving in the military, Cpl. Harold Winsten, Quartermasters Service, and Joseph Winsten, a medical student at the Navy’s V-12 College Program at Brown University. Lieutenant Winsten normally would not have been on the plane. On that day, he was at Westover Field and needed to get to Otis Field. At that time, there was no interstate highway system, and with a war on, and gas rationing, the trip by automobile would have taken about 4 hours. Therefore, it was a common practice to check at the airfield operations center to see if a plane was heading in the direction one needed to go. With a flight scheduled for Otis, he naturally opted to fly instead of drive. The Army, as was the custom, cleaned up the crash site and removed most of the plane. The word “most” is accurate because according to some who visited the site in later years, small pieces of airplane aluminum, the size of a dollar bill and smaller, remained on the ground. Over the years, souvenir hunters, and Mother Nature, have removed all traces of the plane. If someone were to visit the site today, they would find nothing to indicate that a tragedy had once occurred there. Though time and Mother Nature have returned the site to its original condition, we should never forget the names of those who died there while in the service of their country. 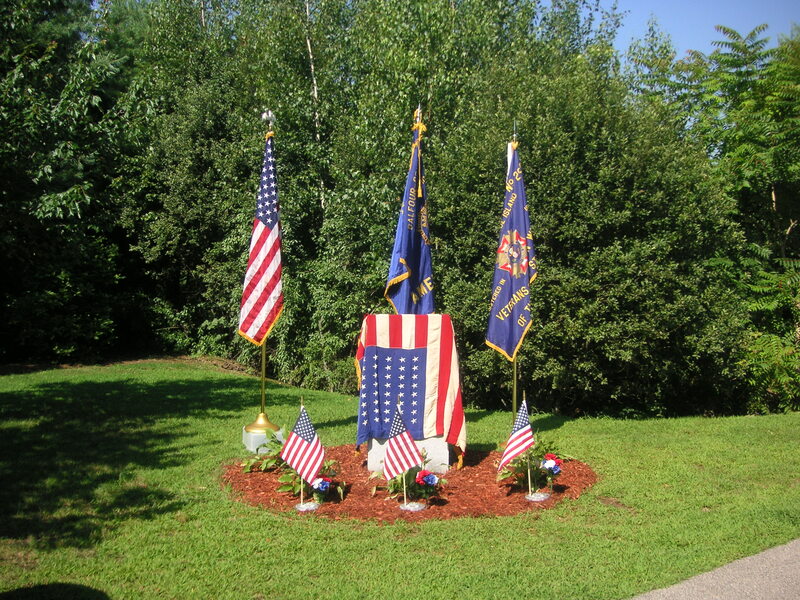 To that end, three bricks bearing the names of Lieutenant Saul Winsten, Lieutenant Otis R. Portewig, and Technical Sergeant Herbert D. Booth were added to the Veterans Memorial in Deerfield Park in 2004. Bricks at the Smithfield Veterans Memorial at Deerfield Park, Smithfield, R.I. 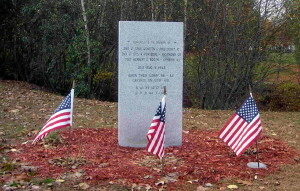 In August & October of 2009, two separate memorials were dedicated to the three servicemen who lost their lives in the Wolf Hill plane crash. 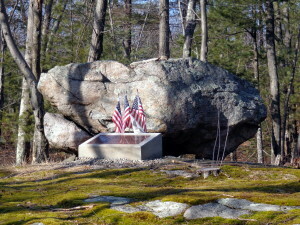 One was placed in Deerfield Park in the Greenville section of Smithfield, Rhode Island, and the second was placed at the crash site in Gerogiaville. Monument honoring three servicemen killed in a military plane crash August 5, 1943 on Wolf Hill in Smithfield R.I. 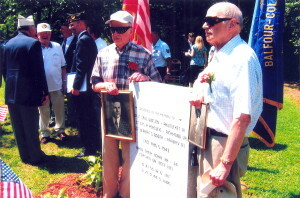 Granite tablet located on Wolf Hill, Smithfield, R.I.
Saul Winsten’s brothers at the Aug. 2009 Deerfield Park ceremony. 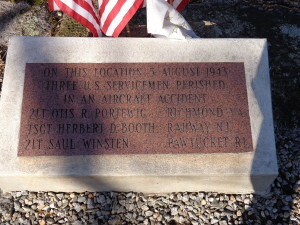 Filed Under: Rhode Island - Military Tagged With: 1943, August 5, Deerfield Park, Georgiaville R.I., Herbert D. Booth, Military Plane Crash Rhode Island, New England WWI Plane Crash, Otis Portewig, RB-34, RB-34 Crash, Rhode Island Aviation Accident, Rhode Island Plane Crash, Saul Winsten, Smithfield R.I. WWII Plane Crash, Smithfield Rhode Island Plane Crash, Smithfield Veterans Memorial, Wolf Hill crash Memorial, Wolf Hill Plane crash, Wolf Hill Plane Crash 1943, Wolf Hill Plane Crash Georgiaville R.I.